Prior to Elliott 7.5, distribution were created in the I/M Distribution To G/L File when BOMP production transactions were posted. Elliott 7.5 adds B/M Distribution To G/L File for all Legacy, Material and Plus Work Order distributions. The B/M Distribution Report prints the information from this file to verify exactly which accounts were updated and the amounts posted. Do not purge if you interface with the General Ledger package. Enter the beginning date of the period to print on the report. 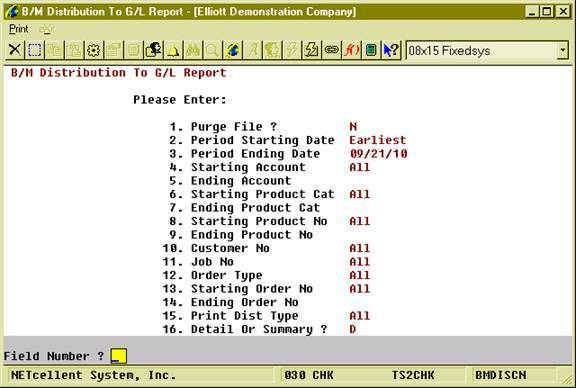 Enter the ending date of the period to print on the report. Defaults to the starting date. If the starting date is EARLIEST, the defaults will be the current date. An account in standard account format. Enter the starting account number of the range of accounts to print on the report. Press the F7 Key to search for an account by account number. Press the F8 Key to search for an account by account description. Enter the ending account number of the range of accounts to print on the report. Press the F7 Key to search for an account by account number. Press the F8 Key to search for an account by account description. Defaults to the starting account number. Enter the starting product category of the range of parent items to print on the report. Press the F1 Key for parent items that have no product category. Press the F7 Key to search existing production categories. Enter the ending product category of the range of parent items to print on the report. Press the F1 Key for parent items that have no product category. Press the F7 Key to search existing production categories. Defaults to the starting product category. Enter the starting item number of a range of parent items to print on the report. Press the F7 Key to search for an item by item number. Press the F8 Key to search for an item by item description. Enter the ending item number of a range of parent items to print on the report. Press the F7 Key to search for an item by item number. Press the F8 Key to search for an item by item description. Defaults to the starting product number. Enter a customer number and work order distributions for the customer that have been copied from COP will be printed. Press the F1 Key to select work orders not copied from COP. Press the F7 Key to search for a customer by customer number. Press the F8 Key to search for a customer by customer name. Enter the job number for distributions to print. Press the F1 Key to print distributions without a job number. Press the F7 Key to search for a Job Number if the BOMP module uses job numbers. Enter the type of orders to include on the report. Enter starting work order number for a range of work orders to print on the report. 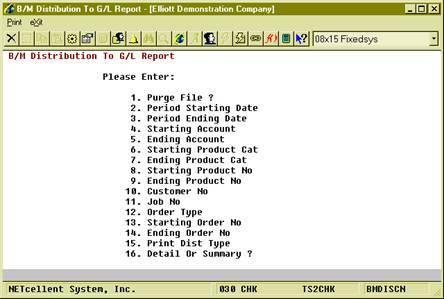 Enter ending work order number for a range of work orders to print on the report. Defaults to the starting order number. 1 for Labor absorb, 2 for Material usage, 3 for Outside process absorb, 5 for Burden absorb, 6 for Inc-WIP, 7 Dec-WIP, 8 for Finish good or Cost of good sold. Enter up to four distribution types to print on the report. 16. Detail Or Summary ? Enter D to print the full detail of every distribution. Enter S and all transactions for a single date for an account will be summarized and print on one line.